Most of the American public cannot wait for this election cycle to end, but regardless of the results, some big questions will arise once the polls close on Nov. 8. While we await the 45th President of the United States to be sworn in, where will Hillary Clinton go after Election Day? I already know what I'll be doing if she wins (celebrating like the Nasty Woman I am) or if she loses (sobbing uncontrollably while plotting my relocation to Canada), but for Clinton, the next move is a bit more tenuous. After an exhaustive campaign, no matter what happens on Tuesday, life must — and will — go on. This has been no ordinary race to the White House, and its final days have been touched with the same drama, darkness, and vitriol that has hung over the entirety of the 2016 election. Opinion polls have been all over the map, questioning whether Clinton's fairly consistent lead and well-prepared ground game can spell final victory. Voting will come to a close between 7 p.m. and 9 p.m., and early projections based on exit polls will begin to leak immediately after. Millions of eyes will be glued to the television as state by state results pour in, and we may see some battleground state projections as early as 7 p.m. EST. Depending on voter trends, we could know the winner as early as 11 p.m. EST, when polls in California, Idaho, Oregon, Hawaii, and Washington close. While we obviously won't know for certain until we're actual in the moment, based on the way these things have historically gone in past elections, here is what will likely happen when the race is called. 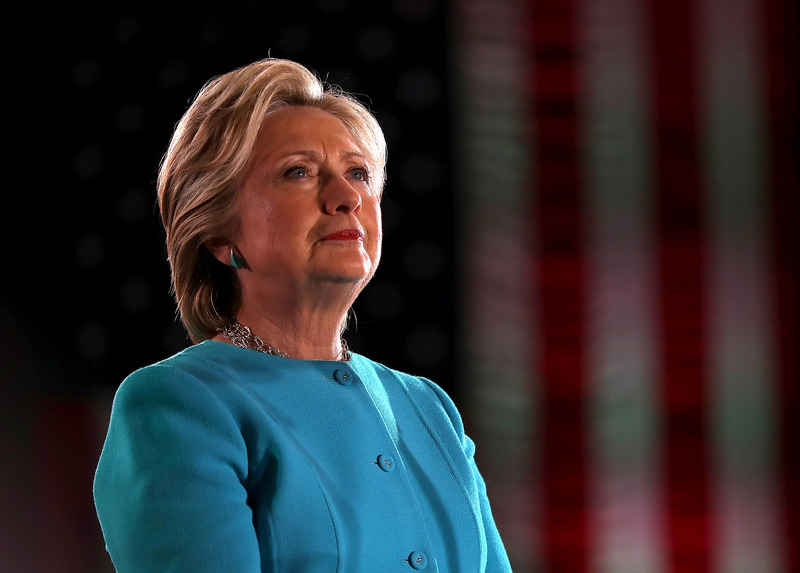 Clinton will hold her official Hillary for America Election Night Event at the Jacob K. Javits Convention Center, on West 34th Street in Midtown Manhattan, which is set to last from 6 p.m. to 11:30 p.m. (Obviously the hope is that the event will be a celebratory one.) The venue complete with its glass ceiling and views of the Hudson River (though the fireworks display has supposedly been cancelled) will make it the perfect place for her potentially history-making victory speech. Crowds will undoubtedly be dancing in the street. Traditionally, once TV networks "call" the election, it is customary for the loser to phone the winner and concede the race. It is necessary for both parties to accept the election results for a peaceful transition of power to take place. Trump hinted in the final debate that he may buck tradition, though, saying “I will look at it at the time — I will keep you in suspense." Clinton may have to wait for Trump's call a little longer than normal, but it will not stop her from assuming the role of President-Elect. Whether or not a candidate concedes doesn't... uh... trump the results of the electoral college, although Trump could conceivably challenge the results. Regardless of Trump's actions should Clinton win, during the two and half month presidential interregnum, Clinton will then gain access to the Presidential Transition Headquarters in Washington, D.C., as well as a comfortable budget of approximately $5 million dollars as regulated by several Presidential Transition Acts. Clinton will appoint a "presidential transition team" to ensure the process of assuming office goes smoothly, and that everyone receives the proper support and training. Clinton and her staff will also discuss their nominations for some 4,000 open government positions. See, I told you she'd be busy! Clinton will also be scheduled to attend an intelligence briefing with the Secret Service. (She previously received a National Security briefing as a nominee in August.) Obama will invite Clinton to tour the White House, after which she would most likely begin announcing her cabinet appointments. Clinton will also continue to shape her policy and agenda; there may even be some trust falls and team building exercises before her team takes the helm. On Monday, Dec. 19, the electoral college will sit to formally cast their ballots. On Jan. 6, before a joint session of congress, the electoral votes will be counted and the official results will be announced by Vice President Joe Biden. The inauguration will be held Jan. 20, 2017. Clinton will be sworn in at exactly 12:00 noon and give her inaugural address, thus starting her four year presidential term. She and Bill will move back into the White House, but the transition shouldn't be too difficult if they kept the drape measurements from last time. Donald Trump will host his election night party at the Hilton in Midtown Manhattan, near the Trump Tower. Clinton will make her concession speech a mere 1.25 miles away, calling Trump to surrender the election (and you know she would do it in the classiest way possible). As Trump has continually promised that if elected president he will hire a special prosecutor to punish her and run her through criminal court, Clinton will most likely lie low during the transition of power. The Trump University fraud trial will begin on Nov. 29, the first of two class-action lawsuits, and will most likely be decided before the inauguration. Just before the electoral college officially decides the president, Trump will again be due in court on Dec. 16 for yet another case. In all likelihood, Clinton will continue working at the Clinton Foundation, giving speeches, and advocating for women and children's rights. If she doesn't win, Clinton will most likely become a strong advocate against the Trump presidency, criticizing Trump's policy as she did during the campaign. It's not know whether she would run a third time for president in 2020, though she may campaign for the Democratic incumbent. The only certainty is that she will continue to be a shining example to people everywhere.